With most of the smart controllers that have been released by landscape lighting manufacturers, you are often limited to what fixtures can be used or face limitations on what the controllers can link to in your home. With these wi-fi lighting controllers you are also dependent upon the manufacturers to release software updates and bug fixes as the controllers age. This is a little worrisome considering most of these companies are not in the “smart home” business. One of the main reasons ClaroLux never released their own “smart controller” was due to the fact that there are larger companies that specialize in this arena and know how to produce incredible products for a fraction of the cost. This year Lutron introduced one of the best smart controllers that is perfect for the landscape lighting industry. It is called the Caséta Wireless System. The Caséta Wireless System offers several control options all of which will link with Alexa – Amazon, Siri – iPhone, and Google – Droid Phones. The Lutron Caséta system comes with remotes, plug in modules, and dimmer switches (with more to come). The system is truly amazing how it can control not only your landscape lights but your entire house. The best thing about Caséta Wireless is that getting started is easy! To add smart lighting control to your home, you’ll need a Smart Bridge or Smart Bridge Pro and at least one dimmer. A starter kit (which also includes a remote) is the easiest way to begin, but you can purchase products individually or mix and match them, too. And you can add more products at any time. That is what is so great about Lutron Caséta’s family of products. The ELV and dimmer is ideal for ELV and LED loads, but is also compatible with incandescent, halogen, MLV and LTE LED drivers. The dimmer also includes a favorite button, similar to the Pico remote, which recalls a favorite preset level on the dimmer. The remote is great for controlling lighting from any where in your home. Caséta Wireless works seamlessly with Sonos for simple and convenient control of sound alongside lights and shades. Spice up dinner at the touch of a button by lowering your shades and setting the mood. With Caséta’s scene control you can wake up to low lights and high-fidelity songs. Or have lights and speakers automatically turn on/off once you’re within a set distance of your home with the geofencing feature. Introducing Smart Away – a new feature of Caséta® Wireless that randomly turns lights on and off during the evening when you’re not home. You can manually trigger this feature in the app at your convenience or automatically trigger it if geofencing is turned on. You can also trigger Smart Away using the Nest Home/Away Assist feature. In addition to being able to tell Siri® to “turn my lights on”, you’re now able to adjust your shades by telling Siri to “open my kitchen shades”. Also, because Caséta Wireless works with HomeKit, any HomeKit-enabled thermostat in your home can now be controlled directly from the Lutron app. Control your lights, shades and temperature from your wrist using your Apple watch. 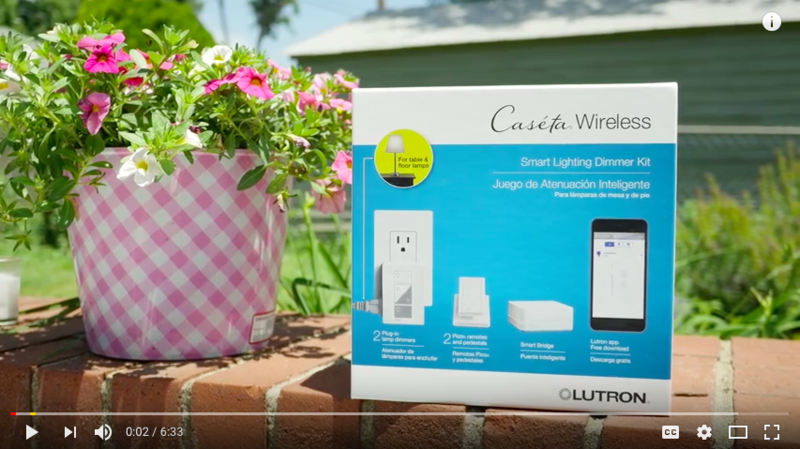 Caséta Wireless dimmers and switches install in minutes, work with numerous lamp types – including dimmable LEDs and halogen lamps, and bring the convenience of a connected home to your fingertips. Where Can I Buy Caseta Wireless Products? 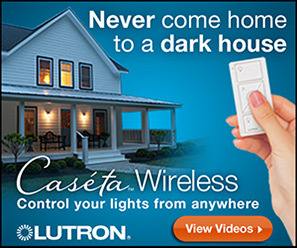 You can purchase Lutron Caséta products at Lowe’s, Amazon, Home Depot, Apple Store, Serena Shades, Best Buy and Build.com. Caseta Wireless Bridge shown above. To control thermostats, blinds, and other devices check out the Caseta Wireless Bridge Pro.